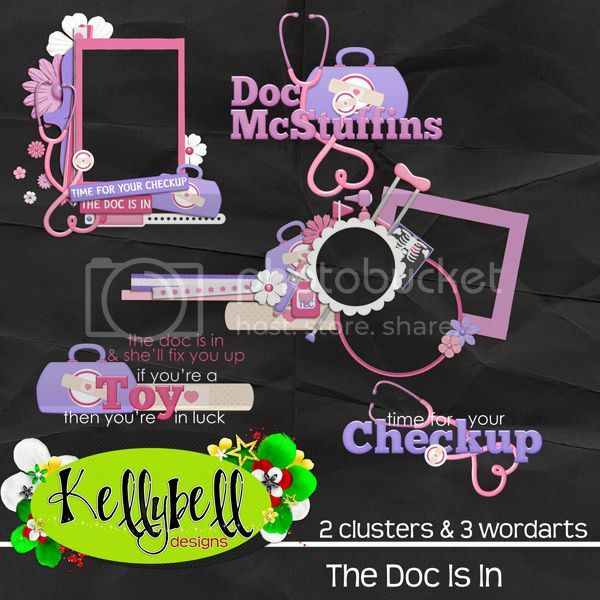 The Freckled Shamrock: Kellybell Designs says "The Doc Is In"
Kellybell Designs says "The Doc Is In"
There's a new character you can meet over at Disney's Hollywood Studios. Her name is Doc McStuffins. She's a little girl who wants to be a doctor, just like her mother. She pretends to be a doctor by fixing toys and dolls with the help of her stuffed animal friends. She's absolutely adorable and is a great inspiration for young gals. Hope you get a chance to snap some photos of her at a meet and greet or at the Hollywood and Vine character meal. Take a look at this new kit. Inside this kit you'll find 10 papers in sweet pastel colors and patterns along with an assortment of elements including a Doc McStuffins doll, x-ray, band-aid, stethoscope, doctor bag, syringe, medicine bottle, crutch, thermometer, reflex hammer, tongue depressor, eye dropper, flowers, frames, ribbons and more. Kelly also has a set of 5 page starters that include 2 frame cluster and 3 word art titles. It's all beautiful! How amazing are these new speech bubbles? So cute! These would be a fun accent for your photos. 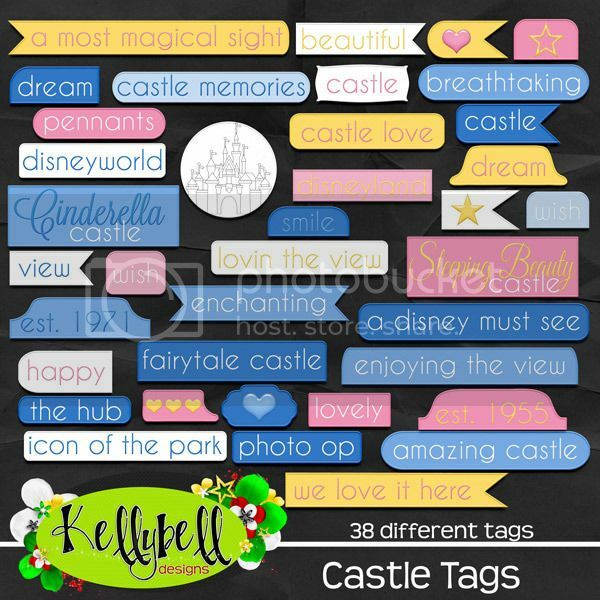 Here's an adorable set of word tags for viewing the castle. The colors coordinate perfectly with That Covers It Vol3. These are so pretty and will make a great addition to your pocket pages. You can find all these items inside the Kellybell Designs Store. They are priced at 25% off this weekend only. Hurry on over to the store to browse around and load up your shopping cart. You can check out Kelly's Blog or Kelly's Facebook Page to see all the Creative Team layouts made with these new releases. Seeing is believing - it's so helpful to see these kits and pocket packs in action on a layout so make sure to view all the eye candy the CT has made for you. Here's one from me. My DH and I were vacationing at the Disney Vacation Club Resort in Vero Beach, Florida last week. While in my room I stubbed my toe so hard that I broke one of the little bones at the tip. The doctor I saw took his x-rays with a digital plate so I was able to receive copies of the photos. I couldn't resist scrapping them with Kelly' new mini kit because it was perfect for the photos..
For your treats today, you'll be getting 3 fabulous freebie from the CT. They always create some good stuff, don't they? You can find a matching freebie here at my blog and then over at Jennifer's Blog and Julie's Blog. Give them a hug along the way please. They work extra hard creating layouts and freebies week after week! I made some journal cards for you . Thanks for stopping by and have a scrappin' weekend! I love your journal cards, thank you! Cute journal cards. Thank you. Kelly has Another Great Sale Coming Your Way!